Earlier this week, I was fiddling around on Twitter when I came across this graphic. 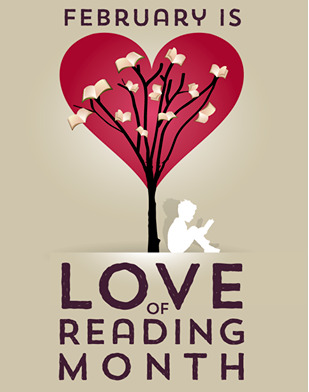 February is Love of Reading Month. How great is that if you are a writer? Most of us love to read. Many writers stick to reading the types of books they write and that is important. Reading new books in your area helps you see what is being published. You’ll note changes in the market and what the competition is publishing. But to develop your skills as a writer, reading different types of books can help you hone different writing skills. Want to brush up on dialog? Read graphic novels. Sure there’s some narrative thrown in there but graphic novel dialog is short and to the point. Characters don’t have the opportunity to ramble. What they say has to drive the story forward. I just finished Hereville by Barry Deutsch. The setting is an Orthodox community and the hero is a tween girl. What about characterization? I often spend too much time on how my character looks instead of how she looks at the world. That's the shallowest and easiest way to characterize. One of the best writers I know at slipping these details in oh so subtly is fantasy author Sharon Shinn. I know how her characters in spite of the fact that she doesn't expend numerous words in telling me. Do you need to study world building? Then read science fiction, fantasy and historical fiction. Note: If you’re going to opt for historical fiction, pick a book set in a time and place that isn’t well known. Writers who tackle these books learn how to introduce readers to complex worlds that they previously didn’t know anything about. Margaret Rogerson did an excellent job of this in An Enchantment of Ravens. Do you have troubles with dramatic action scenes? It can be tricky to build tension, relate all the proper action, and write a scene that is long enough to truly shine. Susan Brockmann is excellent at this whether the scene involves using explosives to get into a safe room or a hand-to-hand fight with a serial killer. Do you find that readers can almost always tell what is going to happen next in your story? Then pick up a mystery. Mystery writers are experts at planting clues in subtle ways while also scattering about red herring. I’ve been brushing up on cozies and have a whole host waiting for me at the library including Murder is Binding by Lorna Barrett and Speaking from Among the Bones by Alan Bradley. Then there’s also the skill of layering everything - set up, hook, plot, pacing, setting, 3 attempts, character building and more. Picture books are a great tool to learn how it all fits together because most of these books do it in 32 pages. Two great examples are After the Fall by Dan Santat and the nonfiction Fallingwater by Marc Harshman and Anna Egan Smucker. One of the great things about being a writer is that we can brush up on our skills by doing something we love to do. Pick up a book and study your craft while also celebrating your Love of Reading. When I say that I read a wide range of books, I'm not joking. I'll pick up just about anything. Thank goodness for my local library. Great tips, Sue! I get stuck reading books in my comfort zone and need to branch out in some of these areas to make my writing better. I especially like the tips about graphic novels and mysteries!